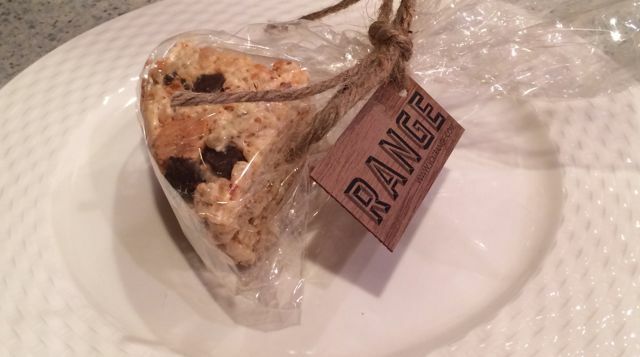 I finally made it to Range, Bryan Voltaggio’s place at Chevy Chase Pavilion in Chevy Chase, MD. And it did not disappoint. What a wonderful dining experience. Every bite was amazing. This visit, I had the pan roasted halibut with the rice grits, yellow corn and chanterelles. Everything was seasoned perfectly. The crispy crust on the outside of the fish balanced the soft flakiness of the fish. The grits were extra creamy and cooked flawlessly. The chanterelles finished the dish perfectly. Meals are served family-style with a variety of great sides dishes to choose from. If you don’t have room for dessert, there is a dessert case in the restaurant so you can take home something for later. It is filled with a variety of truffles, mini cupcakes, dessert bars and my favorite, the s’more rice crispy treat. The marshmallows they used had a smoky flavor and there were big chunks of chocolate chips and graham crackers. It was a great take home treat!